The images on this website are copyright protected. Please contact us before any reuse. 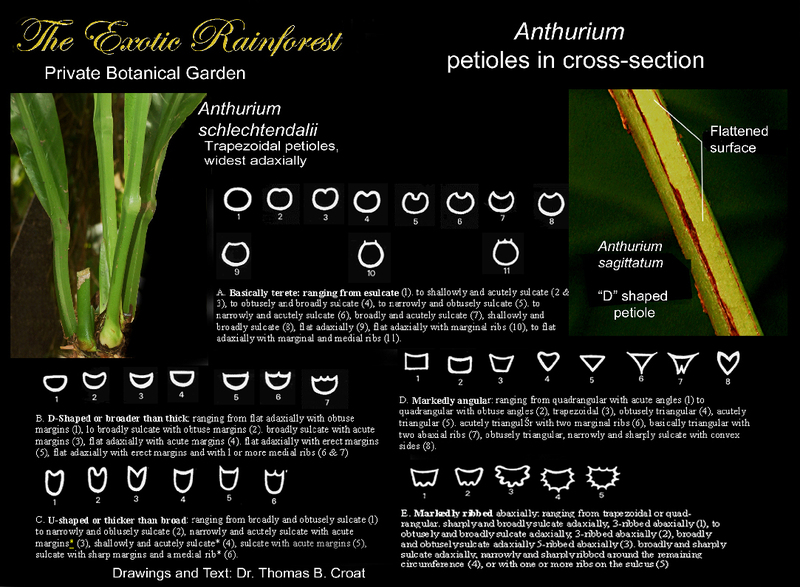 Anthurium including information how Anthurium species grow and reproduce in the rain forest. This text was written and all photography (unless otherwise noted) was created by Steve Lucas, www.ExoticRainforest.com Although as non-technical as possible the information on this page is based largely on the scientific journals of my teacher and mentor aroid botanist Dr. Thomas B. Croat Ph.D., P.A. Schulze Curator of Botany of the Missouri Botanical Garden in St. Louis, MO. Dr. Croat (CROWat) was honored in the summer of 2008 for having collected over 100,000 specimens in the wild. My thanks to aroid expert Julius Boos, aroid, palm and cycad expert Leland Miyano and expert aroid grower Russ Hammer for their input into this article. My sincere thanks to Dr. Croat for his continued guidance as well as frequent personal communication. 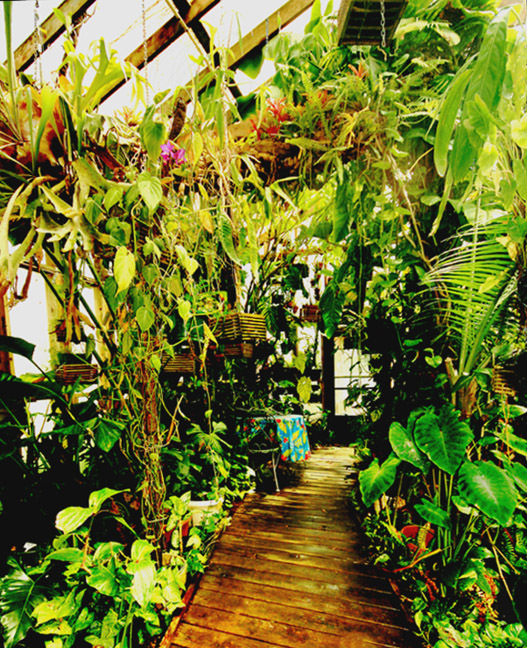 The photo below is of our Exotic Rainforest Botanical Garden. You can find photographs and information on many of the species in our collection by clicking on this link: Species in the ExoticRainforest Collection. this information non-technical while scientifically accurate. If you're interested in the care and cultivation of Anthurium species or Anthurium house plants this article was written to hopefully answer your questions. You'll find the following sections: Where Anthurium are found in nature?, How do Anthurium grow naturally?, Hybrid and "test tube" Anthurium, How should an Anthurium be grown? , Soil mixture, Light intensity, Water requirements, Ideal temperatures, Humidity, How much fertilizer and how often, as well as how to make them reproduce and identify species. Just scroll down if you'd prefer not to read our introductory information. Let's begin with some myths. Some growers believe there is only a single species of Anthurium. Did you know there are many species (types)? Do you know there are likely some 1500 Anthurium species and most look nothing like the plant most people grow? Did you know more Anthurium species live in the rain forests of Central and South America and more grow in trees than in the soil? Are you aware Anthurium species sometimes grow with their roots attached only to a stone? Did you know the beautiful growth on your Anthurium plant most people know as a "Flamingo Flower" or "Flamingo Lily" is not a flower? Instead of a flower it is more like a "flower holder" since it is a modified leaf or bract known as the spathe of the inflorescence. In botany a bract is a specialized leaf that is associated with the reproductive structure of the plant. The spadix at its center can grow a group of very tiny flowers but most people need a magnifying glass to see them! Almost every week someone is directed to this website because they do a search for "aquatic Anthurium species". Sorry, there is virtually no such thing! There are species such as Anthurium amnicola and a few others that grow as rheophytes or riparians living with their roots attached to moderate or large stones in streams that have a fast water flow. Riparian indicates the plant lives near a creek or the shore of a lake while a rheophyte is a plant that has adapted itself to grow either in or on the banks of a fast flowing river. Botanists often differentiate between a true aquatic plant and a terrestrial species based on whether or not the species is found exclusively in water or primarily lives in the soil but may adapt to living in or near the water. The downstream side of a rock sitting in water is where the highest spray and humidity is found. If the plant has its roots in the water it would be able to collect highly oxygenated air as a result of the turbulence moving around the rock. The downstream side of the rock is a safer place to exist since the force of the water is much lower as opposed to the upstream side and the plant would suffer less damage while using the rock as a shield. However, the Anthurium is not truly living aquatically in the water since it is attached to the rock near the water's surface. Instead of being aquatic it is a specialized form of lithophyte or rock dweller (litho-FIT) that uses a specialized position in the river or stream to gain both dissolved nutrients as well as a higher source of oxygen. Despite information on several websites telling you how they believe the name should be spoken, many get it wrong. Some try to tell you to pronounce the genus name "AN-thu-ri-um" or "an-thur-E-um" but those are incorrect. The name is Latin based and is correctly pronounced "an-THOO-re-um". Besides explaining how and where Anthurium grow in nature this text was written to correct many of the Anthurium myths found on the internet as well as help you to understand Anthurium species. If any section below is of no value or interest you may want to skip down until you find what you are seeking since the article is divided into sections. Popular questions asked on the internet include how do I grow an Anthurium, how do I pot an Anthurium, and how do I grow Anthurium from seeds? Two truly strange questions I've personally been asked many times are "can I grow an Anthurium in water" and "please tell me the names all the aquatic Anthurium species"? According to Dr. Croat (see his credits at the top of this page) there is really no such thing as an aquatic Anthurium although there are rheophytic species that grow attached to rocks in fast moving streams. In nature you may find species growing near water but no identified species grows rooted in the water year round. Some grow in water during the middle of the rainy season when the ground is flooded and are obviously water tolerant. The rainy season does not last all year and once the flood waters recede the plants go back to their normal growth. There is one species that has yet to be described to science located in Peru that does grow in creeks but it also grows in soil. Species such as Anthurium sagittatum can live in drainage ditches but this type of growth is not common. As a result I cannot recommend trying to grow any garden center Anthurium in an aquarium or water vase. 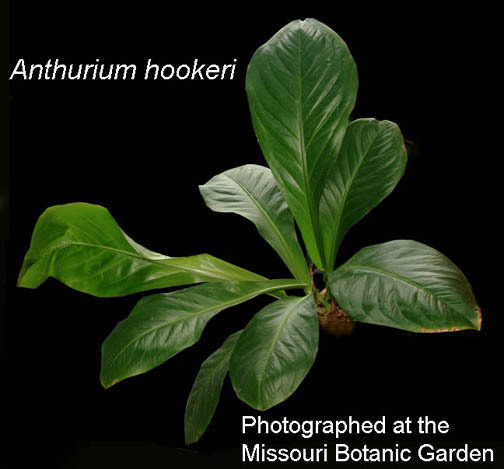 Where are Anthurium found in nature? There are estimates on the internet of approximately 400 to 800 species of Anthurium. In a private meeting with my mentor and friend aroid botanist Dr. Thomas B. Croat on Friday June 20, 2008 at his offices at the Missouri Botanical Garden in St. Louis, MO Tom raised that estimate to a more accurate number. His best guess at that time was closer to 1000 species but in private communcation with several botanists and serious growers he raised the number to closer to 1500 species on August 30, 2010! Many new species are found in South America, especially in Ecuador, every year and newly published species literally makes the total number of species a moving target. As you will see from the photos on this page Anthurium species have many different shapes and forms. Very few have the spathe shape you are used to seeing and there are many more species yet to be discovered. Dr. Croat is recognized as the world's leading authority on the genus Anthurium. Of modern experts he has discovered, named and described more species than any other scientist having personally collected more than 100,000 plant specimens in the wild. Despite a number of articles on the internet that claim up to fifty Anthurium species are found in Southeast Asia according to science none are native in that part of the world. One internet "encyclopedia" appears to be the source of this dubious information. Aroid expert Julius Boos explains, "Anthurium is a Neotropical genus and does not occur naturally anywhere outside the Neotropics!" The Neotropics is defined as South and Central America. part of Mexico and the West Indies. How do Anthurium grow naturally? Anthurium species are grown more like orchids than perhaps any other tropical plant. These plant species need frequent dampening of the roots but they must also be allowed to dry quickly. An important fact anyone interested in Anthurium species must understand is only a few Anthurium species grow in the ground in the rain forest! The majority grow up on the sides of trees or up in the canopy well above the ground. Even many of gigantic "birds nest" forms grow on the limb of a tree not in the soil, but they can be taught to live in soil! So why do they live high in the rain forest canopy? It rains! And the rain is often followed by a drying breeze. Most live on the branch of a tree but can be grown in soil. Some Anthurium species grow on stone but unless you have the facilities to properly grow Anthurium in this manner the method cam be very difficult to maintain. A few live in hot drier rain forest regions but those are not as common in collections. The ones that grow on trees are scientifically known as either epiphytes or hemiepiphytes. An epiphyte (ep-a-FIT) is a plant that grows upon another plant, normally a tree. They grow in the trees because the seed berries eaten by a bird or animal is then left on a tree branch in the animal's droppings. Those seeds find just enough nutrients in the droppings to germinate and begin to grow. Some eventually drop roots all the way to the soil and once they pick up extra water and nutrients grow very large. Others known as hemiepiphytes are epiphytic for a part of their life and begin life in the soil and then climb a tree. While epiphytes are already closer to the sun due to the point where the seed was placed by a rain forest animal the seed of a hemiepiphyte must seek out the light but does so by seeking darkness first. It appears their own DNA directs them towards the shade of a tree so they can begin their climb toward the light and to adulthood. Dr. Croat explains, "I suspect it is auxin controlled. As you may imagine younger plants grow scototropically one assumes because they have to find a tree, rock or wall. Once there they stop growing horizontally and grow upward, effectively toward the light, rather than away from the light." Scototropic refers to the behavior of a tropical seedling vine that grows toward dark objects. The plant does this as an adaptive characteristic that enables the young vine to grow towards the trunk shade of a large tree so it can eventually begin to climb in order to find brighter light. Auxins are plant hormones that control the behavioral processes of the plant. An Anthurium is not a parasite and draws nothing from the tree, it simply uses the host for support. Hybrid and "test tube" Anthurium. Anthurium species are very popular as house plants. Almost anyone who goes on vacation to Hawaii is at least tempted to bring home an Anthurium. The vast majority of the plants grown in Hawaii are hybrid varieties and not species. Most are hybridized from a species known to science as Anthurium andreanum (see photo of hybrid form at the top of this page). That species is found in northwest Ecuador and western Colombia, but it is popular for hybrid 'house plants' since it produces a colorful spathe. A hybridized plant is one that is created by taking the pollen of one species and applying it to the spadix of another species in order to produce a plant that is "improved" or better, at least in the opinion of the hybridizer. In fact, the cross may produce a plant that has larger leaves, larger inflorescences, and inflorescence colors not seen in nature. But that hybrid is no longer either species. Lots of hybridizers grow their plants the old fashioned way and are constantly crossing pollen between species or other hybrids that are not sterile. They then grow the seeds to produce their plants. The majority of these hybrids take too long to grow from seed so major growers have resorted to creating their plants in a test tube through a process known as tissue culture. To tissue culture a plant the lab takes a genetic sample from a parent plant and literally duplicate the cellular structure thousands of times. The chemical clones are then potted in soil and grown by commercial growers. If over dosed with chemical the clone may flower infrequently or produce leaves with odd shapes. Even more important to large commercial growers is the fact they want you to see the plant filled with inflorescences in the store! Commercial growers often use a chemical known as gibberellic acid (often sold as GA3) to induce the plants to produce more inflorescences in order to make it more saleable at the time you are ready to buy. Gibberellic acid is a natural plant hormone and is used in larger than normal amounts in agriculture to stimulate both cell division and cell elongation that affects the leaves as well as stems of a plant. The continued use of the chemical in agriculture eventually affects fruit development. Since the fruit of an aroid is produced on the spadix gibberellic acid is capable of speeding up the the production of inflorescences. In many cases the Anthurium can become addicted to the chemical and once you get it home the plant may produce far less inflorescences than you expect. Since you have no GA3 to continue giving the plant its "fix" it may not produce the colorful inflorescences as often. Gibberellic acid has also been proven to produce badly formed spathes, double spathes, strangely shaped leaves and other malformations. For that reason alone the plant needs near ideal conditions to keep it happy. One caution. GA3 can have unwanted consequences including the death of the plant and should not be used by home growers in almost all cases. But if you've wondered why your Anthurium no longer will produce an inflorescence you may now know the reason. There is nothing wrong with buying a hybrid plant but here's one important note on buying hybrid specimens in a retail store. Do not rely on the advice of a sales person to grow your plant unless you know for certain they are an expert in this genus! Most know nothing about Anthurium species and advice such as allow it to dry out completely before watering again or water it sparingly is bad information. There are a few species that like to dry between watering but those are not the common hybrids found in retail stores! Any suggestion you use off the shelf potting soil is also very bad information and is a guarantee the sales person knows very little about Anthurium species. Commercial growers rarely include good growing instructions because their goal is to sell as many plants as possible. If your specimen dies after you followed the store's instructions and you go out to buy a replacement guess who wins? This is not a slam against the kind folks that work in retail garden centers but it is not in the best interest of the store to give you good advice so the plant will live a long time. They like for you to come back and buy more plants! As a result you will rarely find good growing information attached to the plant. The majority of Anthurium store bought plants are juvenile forms and look very little like the adult form of the species since Anthurium morph as they grow! During the 18th and 19th centuries botanists were confused by the incredible differences in adult forms and juvenile forms and often tried to give each of them a different scientific name. That is one reason some plants have more than one scientific name. Those multiple names are known as synonyms and can be the source of a great deal of confusion among collectors. How should an Anthurium be grown? If you live in a tropical or semi-tropical climate you may be able to simply put your Anthurium in the ground. If it is an epiphyte it may try to climb a tree. If it is a terrestrial form, give it lots of room since many of the "birds nest" species love to spread and can eventually grow leaves 6 feet long! Otherwise proper potting of your specimen is very important if you want it to survive and grow to reach its potential natural beauty. I've seen go into a garden store and a buy very rich potting soil that stays soggy all the time. In most cases the Anthurium will die a slow death since they literally drown! For some reason people believe rich soil makes an Anthurium grow better but off-the-shelf "potting soils" just don't work for these species! Remember, they often grow in trees and don't exist in nature in wet soggy soil. Their roots are designed to collect rain daily during the wet season and then suffer through the dry season. If you were to go into the forest you would see the roots literally get plump as it rains! Even in the dry season they can collect enough water from the humidity around their exposed roots to survive. You can make your plants grow more beautifully and stay healthier if you learn to grow them as they would in their natural habitat. We've heard of many plants ending up in the trash from being subjected to too much water. Some sellers provide Anthurium attached to volcanic rock. There are species known to be epipetric that means they grow on stone. Volcanic rock can work but you must keep those rocks constantly damp. The plant will extract the necessary water from the interior of the porous rock but that does not mean to sit the plant in water. Just keep the rocks wet. No Anthurium species is known to grow in water despite what some websites and sellers try to make you believe. One method used by some serious collectors is to put the Anthurium in a large orchid basket packed with good quality sphagnum moss. Since the plant normally lives in the top or on the side of a tree it can adapt to those conditions and we have a few plants growing on our epiphytic log with no soil at all but you must keep the moss constantly damp. In our atrium we water the plants displayed in this manner almost daily! However, we often leave any soil attached to their roots and do not remove it. We simply pack the moss around the roots as well as mix the soil mixture we will describe with the moss. We also cut the moss into very fine pieces. In a few months you may begin to see the roots extending down through the moss and hanging out the bottom of the orchid basket that is very natural. At one time one of our guests grabbed a pair of scissors and tried to cut them all off because she thought they looked bad. I nearly screamed since this is the way Anthurium plants grow in the forest! You should know this method is tricky to use and requires constant monitoring. The majority of birds nest forms require a period of dryness in the forest in order to survive and prosper! Be aware that far more bird's nest forms that are all members of Anthurium section Pachyneurium grow up in the trees than in soil! People who visit our artificial rain forest are often amazed at the size of many of our birds nest specimens that grow much faster and larger than they often do in many homes. Our very large bird's nest forms hang from the ceiling in large orchid baskets that measure 30 x 30cm (12 inches square) with no soil at all since their roots are packed only in sphagnum moss! Despite the belief of far too many growers, successfully growing Anthurium and other aroids is not just about whether should you water or not water a plant or about the water content of the soil! Many aroids including Anthurium grow in very wet soil! Instead it is about how fast the water flows through the soil, or the lack thereof, that can cause a lack of oxygen, anerobic fermentation and saprophytes that turn into pathogens. Saprophytes are organisms including fungus or bacteria that grow on and draw nourishment from dead or decaying organic matter that often includes soggy wet soil. The pathogens attack the roots and cause them to rot so all of the advice to "slow down on the water" is really about how to control the pathogens. necessarily occur in water and is why we can cause a plant that is about to die to grow new roots in a clean glass of water. many threads to explain the necessity of mixing proper soil for plants but the advice is often ignored since it requires some "work" on the part of the plant's keeper. The reason plants rot is not the amount of water given to the plant! These are rain forest plants and are literally drowned for months at a time! If you could visit a rain forest you would quickly learn the soil is composed of leaf litter, decaying wood, compost and the charcoal left behind when a part of the forest burns. If we'll just listen to Mother Nature we can all make our plants grow as they should in nature. That is precisely what I attempt to explain when I recommend mixing soil, not just buying a bag at the store. Over time we've found a soil mixture that works for most of our Anthurium species. We use this mixture on the advice of the aroid keepers at the Missouri Botanical Garden in St. Louis and grow close to 100 different Anthurium species. Many of our specimens have reached or are beginning to reach their adult size and have produced inflorescences. The goal of this mix is to allow the roots to freely find places to extend and grow without constantly finding wet places where they will rot. This mix will remain damp but drain quickly. The common advice on most garden websites is to allow a plant to dry between watering is not always good advice. Anyone that has asthma knows the difficulty of getting air out and then drawing it back in. A potted plant is much like your lungs. As a result the top layer of a potted plant's soil should not be allowed to dry since that dry soil prevents the intake of fresh air including oxygen! Although plants give off oxygen through their leaves they take in oxygen through the roots. Once the soil dries it creates a "blanket effect" to hold in the stale moisture and keep out fresh oxygen. Once the upper soil dries the moist layer below cannot easily breathe in order to re-oxygenate the soil. The dry upper layer actually prevents the capillary effect of the wet surface evaporation when damp soil is exposed to air. When you pour water in the soil the air inside the soil is displaced. The oxygenated air inside has now left the pot. If the upper soil layer completely dries the "lungs" of the pot cannot work and can no longer continue to draw in another breath of fresh air. As a result the entirety of the soil needs to remain evenly damp so the roots can continue to draw in fresh oxygen. Although we mix our soil based on how a species grows in nature we primarily use a very loose soil mix with 30 % Miracle Grow Moisture Control Potting Soil combined with 20% high quality peat moss, 40% orchid potting media that has hard wood, charcoal and gravel mixed with 10% Perlite™ that is combined and mixed thoroughly with a hand full or two of cedar mulch along with finely cut spahgnum moss. The idea to include charcoal is to increase drainage but also to take advantage of the tiny air spaces in the charcoal for growing beneficial microbes. It helps with water retention, as well. If you have some good compost feel free to add it. Small pieces of charcoal can be purchased from any good orchid supply. We recently had a large walnut tree removed from our yard and once the stump was ground we composted the remains that are now being added to our soil. Extra orchid or aquarium charcoal is also an excellent additive since it helps to purify the soil. The exact mixture is not critical but all of these ingredients should be mixed as thoroughly as possible. Many growers call this type of mixture a "jungle mix" due to its similarity to the very loose soil in a rain forest. The peat, orchid medium, charcoal, mulch, sphagnum and Perlite™ hold moisture and release it back to the roots as needed. The other ingredients keep the soil loose and from becoming hard packed. The roots of the plant will easily move through he mix and will also attach to the bark just as they do in nature on the side of a tree. Depending on the species, we sometimes also add small pieces of crushed volcanic rock frequently sold in orchid supply stores. I've had "nursery experts" write to say this soil mixture won't work due to the orchid potting media and mulch. They claim the bark and mulch will eventually rot and create air pockets in the soil and then kill the plant. They need to tell that to the experts at botanical gardens such as the Missouri Botanical Garden in St. Louis that maintains one of the world's largest collection of Anthurium since they developed the mixture. Botanical gardens in Florida, Europe and other parts of the United States us a similar mixture for almost all aroids. We've been using it since 2003 and our Anthurium as well as Philodendron species just keep growing! The next important consideration in Anthurium care is light. In almost any rain forest, light is a very precious commodity! Plants fight for position and large ones often deprive small specimens of any light at all! Anthurium and other species climb trees to reach the light! As they grow high on the side of the tree they morph into what often appears to be a totally different species! Although a few, mostly with velvet textured leaves, prefer lower light lmost Anthurium prefer bright indirect light. Some will exist in deep shade like your living room but will not flourish. Don't try to grow your Anthurium in a darkened corner, keep them near a window with bright diffused light. Some can be trained to live in extremely bright light but very few will survive in direct sunlight. If you are growing your Anthurium species outdoors keep them close to a tree that will allow them to have filtered sunlight. Light bulbs just don't provide enough intensity or the right spectrum to keep an Anthurium specimen happy and healthy. "Grow lights" may make them "grow", but won't make them flourish. Filtered, relatively strong light is best. The light coming through a window is much stronger than the light from a inflorescent tube. Your plant will reward you with a dramatic change in the production of inflorescences and leaf shape if you give it what it craves! Watering is important to the proper care of your Anthurium. In our rain forest we sometimes water every other day of the week but we vary the water schedule to include more water in the heat of the summer and less in winter. Some days we find it necessary to water twice daily. Our system has an automatic overhead misting system that is designed to duplicate a rain forest. Anthurium species are rain forest plants and receive frequent watering in their natural habitat. But do not over water, just be sure and use a porous soil mix as described above and keep the plant humid with misting from a spray bottle. You can also place a tray of water beneath the pot that will evaporate around the leaves to increase the humidity in the immediate area. There are species that prefer a longer dry period including all the birds nest types and we attempt to segregate those during the winter season. Section Pachyneurium species (birds nest types) must have a dry period and often go for a month or more with no water at all. These species must have the dry period in order to remain viable. It often rains daily in the "rain forest" for 9 months or more per year! Most prefer to have their roots damp all the time, just not in soggy soil. In your home, water often enough to keep the soil damp, but not soggy and make sure the pot can drain easily. It is best to never use a pot that cannot drain but if you must use a pot with no drain holes in the bottom then add a minimum of three inches of gravel (non-limestone) beneath the soil mix so the water can drain. We attempt to explain the details on individual species on each of our web pages. How much fertilizer and how often. In nature an Anthurium receives only natural forms of fertilizer since there is no one in the forest to go around with a big bottle and sprinkle it on everything! The epiphytic species can collect minerals in the rain that comes from the winds blowing across the Atlantic from Africa. Those winds often bring dust from major dust storms in the African plains to the rain forests of tropical America and once it settles in the rain the long dangling roots of the plants can gather a small amount of dissolved minerals and nutrients. They also gain fertilizer from decayed vegetation (leaves) that collects around their stems and roots but they receive nothing near the amount of fertilizer home growers are prone to give! Excess fertilizer can kill your plant so don't use more than the manufacturer recommends. In most cases use less! Less is much better than too much. Regarding fertilizers, aroid expert Julius Boos wrote, "It is also the epiphytic plants that benefit just as much from falling debris and rain! Many 'birds-nest" type plants actually grow on trunks and branches of trees. In French Guyana we saw a species of Philodendron that grows like a vine up tree trunks, and when it reaches a suitable spot, changes form from a climbing vine and becomes a 'birds-nest', catching leaves. It then creates an area where ants actually build their nest in the roots and amongst the leaves/debris mix. These ants also provide lots of fertilizer with their by-products, left-over insect and fruit parts, etc.. The rain also washes debris and the nitrogen it picks up and contains on to the long, pendent roots of other species." Species, such as the terrestrial "birds nest" forms are designed to collect falling vegetation: leaves and other debris. In nature, those species will often be found with piles of dead leaves and other plant material inside their conical base. That material then decays and the result is a natural form of fertilizer for the plant, especially when insects are invited to set up home. But most collector/growers carefully collect and clean out all dead and decaying material found around their plant! We are then depriving the plant of the natural form of fertilizer for the sake of "beauty". As a result most experienced growers do not fertilize heavily or often. Instead they fertilize sparingly. Most adhere to the recommendation to "fertilize weakly, weekly". Simply that means adding a small amount of fertilizer to your water and give it to your plant often, best once each week. A good recommendation is 20% of the manufacturer's recommended amount. Large doses of artificial fertilizer do little to encourage the plant to grow as large as it will in nature but minimal doses of liquid fertilizers can cause your Anthurium to reach an unusually large size and beauty. An alternate method used by successful commercial aroid growers is to use the pellet form of Osmocote 14-14-14 or Nutricote 13-13-13. Osmocote is available at most home improvement stores while Nutricote is sold at agricultural suppliers. The pellet fertilizer lasts 3 or more months and dissolves slowly. You will achieve best growth if you use about 10% of the manufacturers recommended amount but give it to the plant more often than is recommended. Fertilzer does not produce more frequent inflorescences! Anthurium species are seasonal. Some species freely produce an inflorescence any month of the year but others are designed by nature to only reproduce during a particular season of the year. Magnesium in the form of Epsom's salt. Anthurium species as well as many other tropical plants also enjoy an occasional dose of Magnesium. This is easily supplied in the form of Epsom's Salt that is available at any garden center. Using this product monthly will make the plants respond well. Follow the manufacture's instructions (1 to 2 tablespoons per gallon of water) if you are using a garden sprayer but if you need to mix it in a glass add only 1/2 teaspoon to a large glass of water and use that for a single watering. Give the balance to other plants or dispose of what the plant cannot absorb in a single watering. Do not make the soil soggy. All Anthurium species are tropical that means they can't tolerate really cold temperatures. Some do live high in the Andes Mountains well above the cloud line and are "cool" loving species. But they don't like cold! The cloud forest species do not like heat and won't do well in an outdoor setting where the temperature may stay above 26.6C (80 degrees F) for long periods of time. They can tolerate short spells of high temperatures, but some, such as Anthurium rugulosum, (photo left) may not survive. Many growers of these cool loving species use a high humidity "wet wall" combined with a small air conditioning system to keep the ambient temperature low and the humidity high. Many of these species will do well down to 4.45C (40 degrees Fahrenheit), but not much cooler. As a rule never allow the temperature around most of your Anthurium specimens to drop below 12.75C (55 degrees F). It is best to keep them well below 32C (90 degrees F) that is not particularly difficult if you grow them in some form of shade or filtered light. Some species will tolerate short periods of cold like that found in Central Florida but most won't survive anywhere outdoors north of zone 9. The are zone 10 and higher species! Most will die quickly if exposed to a freeze. Ssince most grow faster when the temperature is in the 21 to 29.5C (70 to 85 degree F) range you may find your specimen will appreciate being allowed to live outdoors during the spring and portions of the fall. Humidity, a little or a lot? Humidity is extremely important! Do everything possible to keep the humidity high around your Anthurium. These species live in a jungle that often has a humidity level near 100%! If you live in a climate that has a low humidity such as southern California you will need to provide a method to increase the humidity around your Anthurium. In our artificial rain forest the humidity is always 85% or higher due to the waterfall and pond in the center of the room as well as frequent watering! Some growers keep their Anthurium species near a swimming pool to allow for a constantly high humidity. Air circulation is equally important since the air is almost always moving in the rain forest. Avoid stagnant air since that may encourage mold, fungus and insect predators. If you can't give the species rain forest humidity conditions then there is a simple alternative. Place an attractive shallow dish filled with water beneath the plant's pot. Fill that pan with gravel, preferably one that does not have too much limestone. Fill the pan and gravel with water and then sit your plant and pot on top of this gravel bath in to create a micro-climate around the Anthurium. It works! Water will evaporate around the leaves and fool the plant into believing it is living in a humid rain forest environment. When you water the excess will simply drain into the gravel pot. Why do you want to avoid limestone gravel? If you use the soil mixture we suggest, you've just created a soil mixture with a pH below 7, likely around 6.5. The Anthurium will appreciate that pH level! If you add limestone to the mix, the pH can be raised to above 7 and the Anthurium is not as likely to appreciate that level with the exception of a few species that do live in higher soil pH areas of the tropics. How do I know my plant is an Anthurium and not a Philodendron? All aroids produce an inflorescence so the production of a spathe and spadix alone does not prove the plant is an Anthurium. Anthurium species have two unique features that can easily be observed by a plant collector. Those features are known as the geniculum and the collective vein and both can be seen on any Anthurium specimen. The geniculum is located at the top of the petiole that is the stalk that supports each leaf. The geniculum allows the leaf to rotate and orient itself in order to better collect sunlight. The geniculum looks and works something like your knee or elbow. Just like your elbow allows you to bend and rotate your arm the geniculum allows the leaf of an Anthurium to rotate itself up, down or from side to side. The geniculum may be swollen and obvious in many species but barely noticeable except to the touch in others. Aroid expert Julius Boos explains, "the geniculum acts like a ''wrist'', and actually allows the leaf blade to turn or rotate to align itself with the light source and occurs only on some aroid genera including Anthurium and Spathiphyllum but not on others." Any leaf contains several different vein forms. The centralized rib vein is known as the mid rib and there are large veins known as the basal ribs, primary lateral veins, interprimary veins with the smaller known as the tertiary veins. The tertiary veins are the repeatedly branched veins that arise from and are connected to the primary lateral and interprimary veins. The reticulate veins are the smallest visible vein form found within small areas called areoles (also a condition known as areolate). 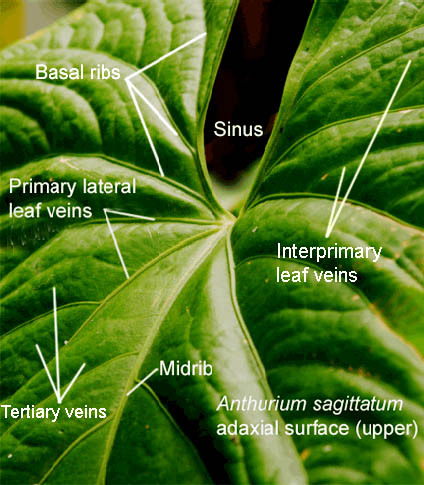 The primary lateral leaf veins on any Anthurium connect into that collective vein. The area between the leaf lobes is known as the sinus. The collective vein is a specialized vein submarginal vein found near edge of a leaf. Collective veins come in pairs (one on each side of the leaf) and are simply the union of part of all of the primary lateral leaf veins that extend all the way to the tip of the leaf (apex). A submarginal vein that lies parallel as well as near the leaf margin (edge) into which the primary lateral veins run. The collective vein almost completely encircles the leaf in some species but in others begins approximately 1/3 down from the top of the blade and emerges from one of the primary lateral leaf veins to run around the bottom of the blade and up the opposite side to reconnect with a primary lateral leaf vein on the opposite side as a continuation of a primary lateral leaf vein. 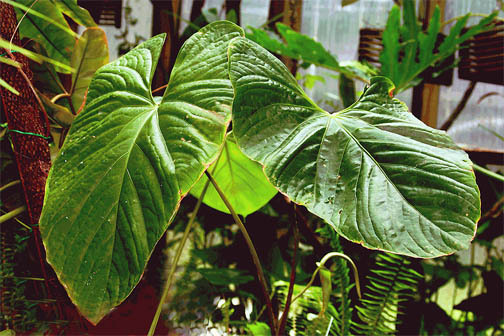 Collective veins may be observed in Anthurium, Syngonium, Alocasia, Colocasia, Xanthosoma, Arisaema, some Amorphophallus as well as other genera. 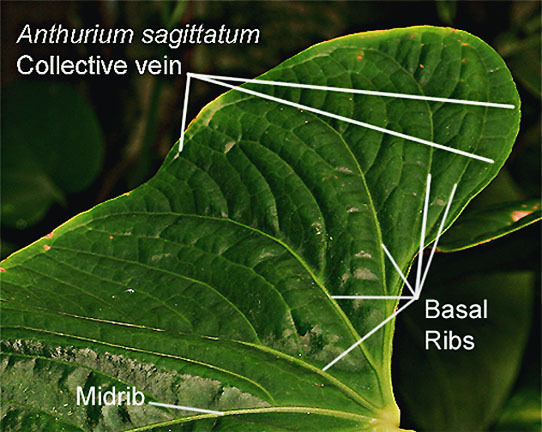 The geniculum and collective vein as combined features are unique to Anthurium species although other plants have one or the other. Neither will ever be seen in a Philodendron species. These features combined are often used by botanists and serious plant growers as a determining factor to decide if a plant is or is not an Anthurium species. Since most people who read this article are not aware of the scientific characteristics of Anthurium species you can find adjacent photos that illustrate these important features. What is the difference in a stem and a petiole? A petiole is the support of the leaf and is also a part of the leaf. The stem is the support for the entire plant. As you have likely realized the petiole is what most people often call a "stem" but that is an incorrect use of either term. The stem is the plant's base or axis and is the plant's support but is not the stalk that supports any single leaf. The stalk that connects the leaf blade to the stem is correctly known as a petiole. Some internet definitions don't make the distinction clear between a stem and the petiole since the petiole is truly a part of the leaf structure. Dr. Croat explains, "A leaf consists of a petiole and a blade. A petiole may also have a sheath and a geniculum. As a further twist the geniculum actually extends briefly onto the blade at times so is structurally a part of both the blade and the petiole even though we consider it to be technically a part of the petiole." When you read statements on sites such as Wikipedia that state "A stem is one of two main structural axes of a vascular plant" the article is talking about the entire leaf unit, not just the leaf blade. The stem and petiole are not one and the same. The second main structural axis mentioned is the root system. A stem may take on one of several shapes and may even grow underground while a petiole attaches the blade to the stem. If this is unclear, this link explains more: Stem or Petiole? As you can see below, the shape of the petiole may vary greatly from species to species and is a very important part of correctly identifying any Anthurium species. If you are attempting to identify a plant in your collection knowing the shape of the petiole can be critical to learning the correct species' name. 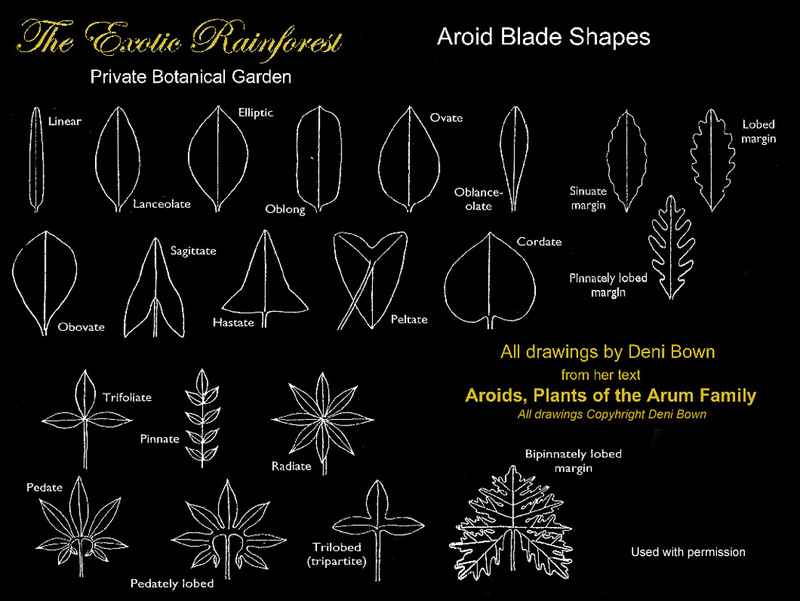 The drawings are courtesy of Dr. Tom Croat of the Missouri Botanical Garden. Natural variation in the shape of the plant. If you plan on growing an Anthurium it is smart to first learn just how the species grows in nature (assuming it is a species) and then try to duplicate that condition as best possible. This is important if you wish to experience the natural beauty and full growth potential of the specimen. Although aroid species have a general "blade shape" in the adult form, that shape may change as a plant matures. One major problem with figuring out what species of Anthurium you are growing is caused by a phenomenon known as "variability". Anthurium species can have a variety of leaf shapes within a single species. Not all the leaves on a single plant will be identical in shape. Think of it as human beings all having different "faces". There is only one species of humans but humans have many "faces". An Anthurium species also has "faces" or growth forms that often makes the identification of a particular species complicated. 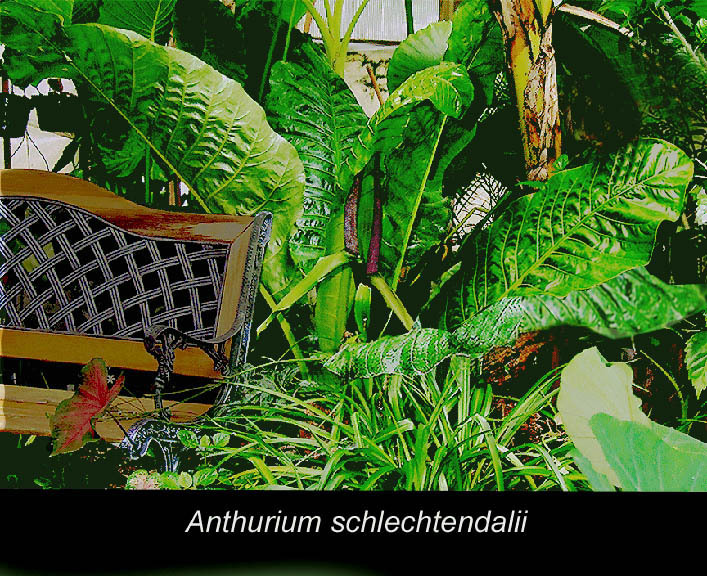 As you can easily see from the few photos on this page an Anthurium has no set shape! You would like to understand how any plant can have a variety of leaf shapes you will find the answers in our article on Natural variation. Tje drawings below are courtesy of Deni Bown. All Anthurium species are members of the larger plant family known as Araceae and are commonly known as aroids. An aroid is a plant that reproduces by producing an inflorescence known to science as a spathe that is only a modified leaf. The inflorescence that is sometimes shaped like a hood or cupped hands is made up of several parts. The portion that appears to be a "flower" or hood is the spathe and inside is the spadix that somewhat resembles an elongated pine cone. The spadix is a spike on a thickened fleshy axis that can produce tiny flowers if the plant is not sterile. Should you plan to grow your own Anthurium seeds do not pot them in soil! Instead, gently squeeze the seeds out of the mesocarp pulp of the berry into a jar with clear sterile water and shake the capped jar well to separate the pulp from the seeds. In a couple of days the seeds will settle to the bottom and the pulp will rise to the surface so it can be removed. Remove the seeds and put them in a clean jar of water and shake once more to remove any traces of the pulp that can cause the seeds to produce a fungus. Prepare a shallow plastic container (such as a restaurant salad container) by cutting long strand sphagnum moss into very fine pieces and mix in approximately 1/4 aquarium charcoal. Press this fine mix into the bottom of the container but do not add any soil! Be sure to punch drain holes in the container's bottom before filling and do not allow the container to hold water! One important goal is to have a high humidity environment in which the seeds can germinate. You need no more than 1/3 of the container to be filled with the moss growing bed that will now be similar to the floor of a rain forest. Spread your evenly spaced seeds across the surface and mist them lightly with either rain water or bottled purified water. Do not attempt to cover or bury the seeds! Put on the lid of the container and you now have a miniature greenhouse. Store the seeds in moderately filtered light in a warm room and in two days to a week you will see germination. Mist them only as needed. Continue to grow the plants with the lid on and just mist them lightly until they are well developed and then transplant them to fast draining soil that contains peat moss, shredded sphagnum moss, hard wood charcoal (such as aquarium charcoal) and high quality potting soil in roughly an equal mixture. In a year or two you'll have nice specimens to display or give away. Anthurium plants are not difficult to grow! Growing and the care of Anthurium species is not difficult. Only a few are hard to grow, and most will grow fairly well under less than ideal conditions. 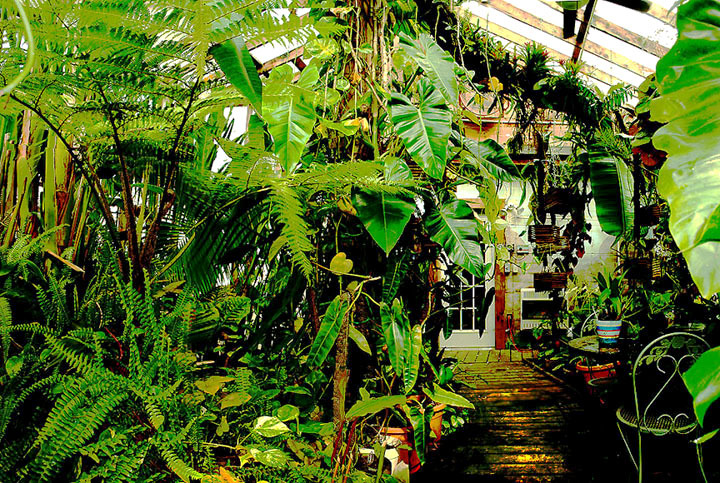 The keys are allowing the epiphytic forms to climb, giving the spreading types room to spread, fast draining soil that stays damp, a stable temperature, good air circulation, and good light that is relatively bright. It's just that easy! Although this article is a brief introduction to Anthurium species there is far more to learn! We strongly recommend you consider joining the International Aroid Society in order to learn even more. Through the IAS discussion forum Aroid l you can ask questions to many of the world's top Anthurium experts and be assured of a qualified answer. You'll also receive an annual copy of the IAS journal Aroideana which is highly respected in the scientific community as well as four quarterly newsletters. Annual membership is only $25.00 per year in the United States, slightly higher elsewhere to cover postage! Concerned about calcium oxalate crystals? Have you been convinced they are a "deadly poison"? Want to join an aroid discussion group?